Dr. Noel Marie Zagre, MPH, PhD is UNICEF’s Regional Nutrition Adviser for Eastern & Southern Africa and Ambassador Gary Quince is Head of the European Union Delegation to the African Union. JOHANNESBURG, Sep 24 2014 (IPS) - Eric Turyasingura chases after a ball made from plastic bags outside his mud-brick home in the mountains of southern Uganda. Development agencies say significant progress has been made in ensuring children are properly nourished, and as a result, the incidence of stunting is declining. However, huge challenges remain and in sub-Saharan Africa, the proportion of stunted under-fives is two in five. With crises in South Sudan, the Central African Republic, Syria and now Iraq displacing millions of people, combating hunger and ensuring stunting rates don’t creep back up has become a top priority. “We will not eliminate extreme poverty or achieve sustainable development without adequate food and nutrition for all,” said U.N. Secretary General Ban Ki Moon at a meeting of global hunger agencies in Rome. As such, the first “pillar” of Secretary General’s “Zero Hunger Challenge” aims to eliminate stunting in children under two years old. The United Nations Children’s Fund (UNICEF) is also a partner in the Scaling Up Nutrition (SUN) Movement, another major global push, bringing together more than 50 countries in an effort put national policies in place and implement programme with shared nutrition goals. One innovative programme – the Africa Nutrition Security Partnership, being implemented by UNICEF and funded by the European Union since 2011- is combating stunting both at the community level and the institution level. Acutely malnourished children at risk of death are directed to health clinics, and at the same time health institutions and partners are given the tools they need to improve infant and young child feeding practices and hygiene, and better fight hunger and disease. The four-year programme focuses on Ethiopia (with a stunting rate of 44 percent), Uganda (33 percent), Mali (38 percent) and Burkina Faso (35 percent). The aim is to change behaviour among households, set up systems for effective multisectoral approaches and increase government capacity, enabling these countries to battle against the effects of hunger long after the programme is complete. In Uganda, for example, community workers have been provided with smart phones, programmed with information about hygiene, postnatal care and proper infant and maternal diet. The workers share the information with household members and then log their location on the smart phone’s GPS to prove they were there. In Mali’s capital, Bamako, funding has been provided to broaden a master’s degree to provide advanced training to healthcare professionals about how to best design and implements nutrition programmes. In Ethiopia, schoolgirls are being encouraged to delay marriage and pregnancy until they are at least 18, as a way of preventing intergenerational undernutrition. Older women are better able to carry a baby and rear children with stronger bodies and minds. The increased focus on stunting by the humanitarian community is telling: its prevalence has become a kind of litmus test for the well being of children in general. A child who has grown to a normal height is more likely to live in a household where they wash their hands and have a toilet; is more likely to eat fruit and vegetables, is more likely to be going to school; is more likely to get a good job; and is less likely to die from disease. Moreover, tipping the balance in favour of a child’s future isn’t as hard as some might think. The simple act of reinforcing the importance of exclusively breastfeeding a baby for the first six months of his or her life, for example, increases an infant’s chances of survival by six times. Most of the regions where the partnership is being run have ample food to go around. It is other factors, such as failing to properly wash and dry utensils after meals, selling nutritious homegrown foods at market rather than eating them, and cultural sensitivities to things like vegetables and eggs that are causing problems. As such, simply education programmes can make a real difference and save countless lives. The other challenge is ensuring there is enough political will to keep those programmes running. 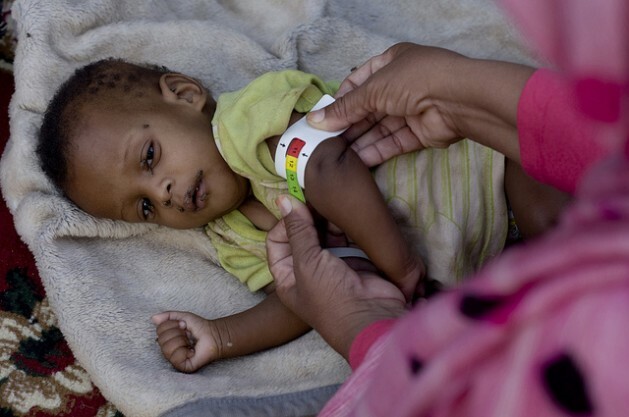 If the international community remains focused, the downward trend in stunting will continue. It could only be a few short years before children from modest African communities like the mountains of southern Uganda get to really play for teams like Arsenal. Children just need to be allowed to grow to their full potential and good things will follow.